It was very early in my career as a school librarian that I realized how important the principal was to the library program that I could create. Principals impact, influence, or control (choose the appropriate verb based on your experience) library budgets, scheduling, staffing, and programming. 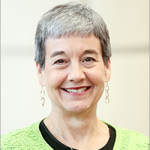 They can also set the tone among faculty for attitude toward and use of the library and its services. While it might be ideal for our principals to come to their administrative positions knowing all about the job that we do, this is typically not the case. Although most administrators have been classroom teachers, very few have past experience working as school librarians. Much of my research throughout my career then has focused on principals’ perceptions of our instructional role and how they come to those understandings. As a rule, principals do not learn what librarians do from their educational leadership coursework. 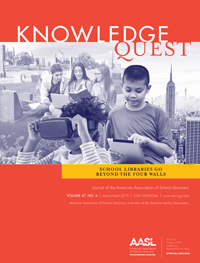 Few articles about school libraries appear in the journals in their field, and sessions about school librarians are rare at their conferences. Based on the findings from my studies on Virginia principals, both elementary and secondary, 92% learn what librarians do from the librarians with whom they work…which puts the responsibility right back in our laps! There was little question then, as I reflected on the focus for my presidential initiative, that it would be on school administrators and how we might help them to better understand the critical role that we play in student learning. Deb Levitov, Editor, Teacher-Librarian (NE), kindly agreed to chair my Presidential Initiative Task Force; Priscille Dando, Coordinator, Library Information Services in Fairfax County Public Schools (VA), and Michelle Folk, Teacher Librarian at Fort Atkinson Middle School (WI), agreed to serve on the task force. I asked them to curate a limited number of select quality resources in a variety of formats, create suggestions for sharing these resources, and develop a mechanism to measure the effectiveness of the initiative. And what an amazing job they have done! 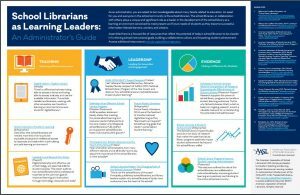 “School Librarians as Learning Leaders: An Administrator’s Guide” is available in two formats: an infographic and an annotated resource guide. The two documents feature the same resources but are organized differently. 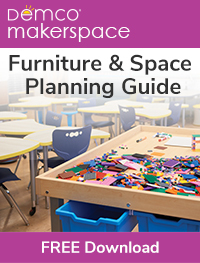 The infographic presents the resources categorized by topic under the headings of Teaching, Leadership, and Evidence. The annotated resource guide presents the resources organized by format (Infographics; Journal articles, position statements, reports; and Videos). “Usage Survey,” a quick and easy survey that will provide AASL with feedback on the use of the various resources. Task force members joined me on the May 18 broadcast of Larry Jacobs’ Education Talk Radio, “Administrators and School Librarians: A Powerful Partnership for Schools and Learning,” to talk about the initiative. They will be sharing and discussing the resources with members of the Affiliate Assembly at Affiliate Assembly II on Sunday, June 25, at the ALA Annual Conference in Chicago and presenting a session, “Advocacy Begins with Each of Us: Resources and Strategies to Foster Administrator and School Librarian Partnerships,” at the AASL National Conference & Exhibition in Phoenix in November. Additionally, AASL will have a presence in the exhibit hall at the first-ever joint conference for pre-K through grade 12 school leaders National Principals’ Conference in Philadelphia in July where Executive Director Sylvia Knight Norton and I will share the infographic and emphasize to principals the key role that school librarians play in student learning. 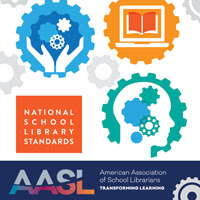 As materials go out from the AASL Office to state affiliates for distribution at conferences, the “School Librarians as Learning Leaders” infographic will be included. And, of course, please feel free to download, print, and share! As school librarians we are learning leaders in our schools. My hope is that these resources will be useful to you as you share the message with your administrators that #SchoolLibrariansTransformStudentLearning. Thank you so much for this!!! I feel this has been where we have needed to focus our advocacy efforts for years and have been very frustrated that administrators do NOT get any training about what our jobs are supposed to be and how we contribute to the learning community! Audrey, I feel like I have just grabbed the golden ring! I was preparing a summer PD session on communicating to administrators the librarian’s value in a school , when I opened this KQ blog post this morning. 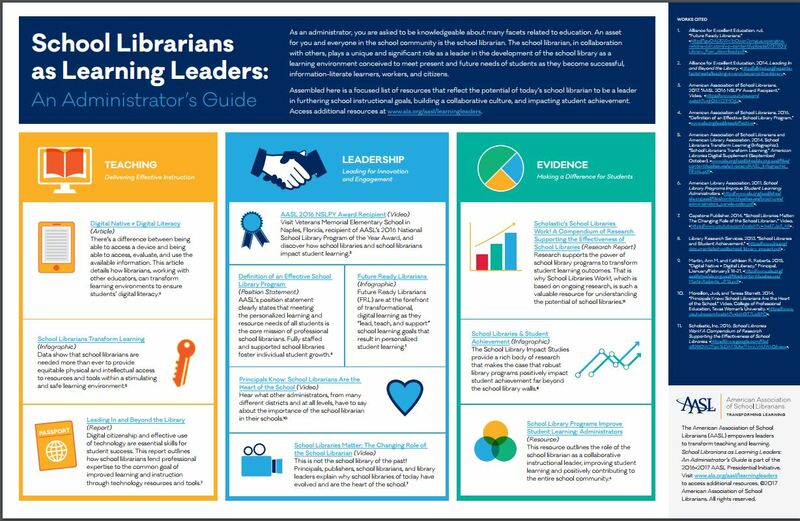 Many thanks to you for your presidential initiative with its focus on educating administrators about the librarian’s role in learning and to Deb Levitov, Priscille Dando, and Michelle Folk for creating these excellent resources. I can’t wait to share these documents with Dallas ISD librarians! Thanks so much for your feedback! All the credit goes to Deb, Michelle, and Priscille for their dedication and hard work this year. I’m so glad that you find the resources to be useful.